Green Moon Dal( This is moong lentils with the green covering unlike the yellow moong dal): 4 heaping Table Spoons. Rice: 4 heaping Table Spoons. Some Sugar & a Little Clarified Butter and Milk OR 200 gm Fresh Curd. As per choice. Mix the lentil and rice together and clean and wash the mixture in water and let it soak in water for 10-15 minutes. Throw away the water used to soak the lentils & rice mixture and put the mixture in a pressure cooker. Add about 400 ml of water with the salt and the turmeric powder. Pressure cook at high flame till the cooker whistles once then lower the flame to simmer for 10 minutes. Switch off the flame after 10 minutes. Let the cooker cool down on its own for 5-10 minutes. The ‘khichari’ is ready to be served. It can be eaten with salt as it is Or with milk and sugar and clarified butter Or with fresh curd and salt or sugar Or with only sugar. It is very light on the stomach and is generally made when somebody is recuperating from an illness. 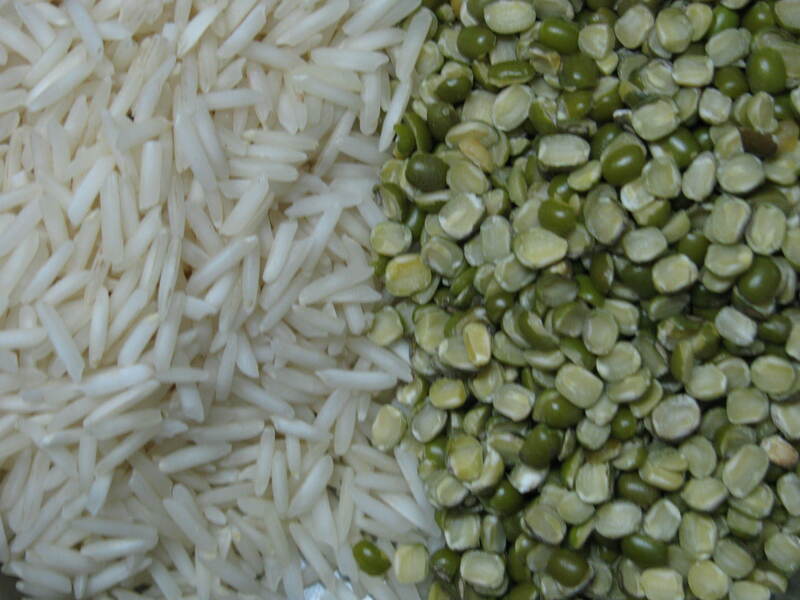 The 50:50 ratio of the rice and green moong dal can be varied according to a persons choice. 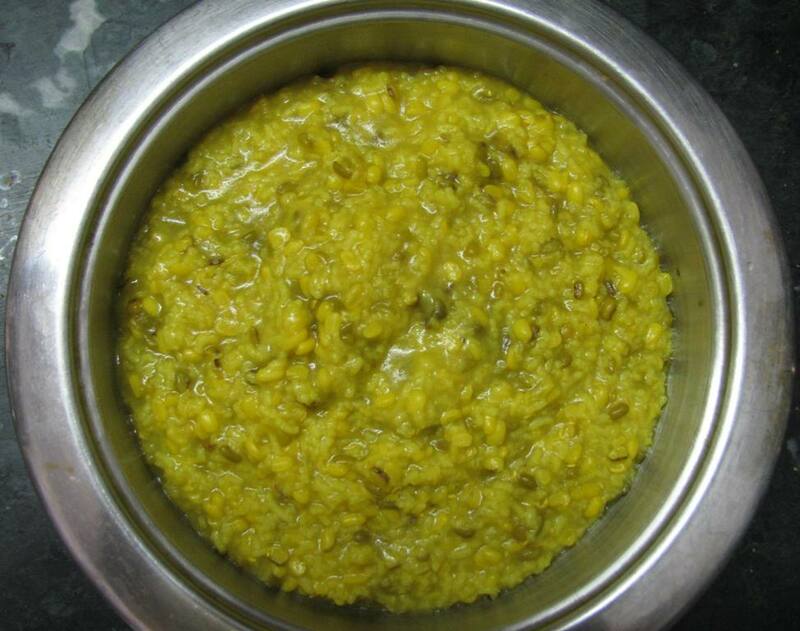 If you are in a hurry and do not have the time or inclination to soak the rice and green moong dal mixture in water before pressure cooking the mixture just wash the rice and dal thoroughly in water and add 100 ml extra water to the mixture and cook for the stipulated time. If you are a novice in the kitchen and know enough cooking to boil water this recipe is for you. We are just going to assemble a few processed goodies and some vegetables and rice to make a wonderful meal. Grate all the vegetables and mince the spring onions. Put the spring onions aside.Take a wok add a little ghee and sauté the vegetables for 5 minutes. Add 3 cups of water to the vegetables. Add the chinese Knorr Manchurian make a meal mixture and bring to boil. Simmer for 5 minutes. Set aside. In a little water boil the chicken cube or the vegetable cube ( as per your taste) and set aside. Boil 4 cups of water in a pan add 1/4 tea-spoon salt and add 2 cups of Soya chunks and boil for 10 minutes. Use a strainer to get rid of the water used to boil the Soya chunks and to wash them in cold fresh water. Squeeze out the excess water.Put some ghee in a wok and fry the Soya chunks till they are a little brown. Add the boiled chicken or vegetable concentrate to the wok and bring to boil till the chunks absorb the concentrate a little and add the mixture of Soya chunks and concentrate to the Manchurian sauce.Garnish with the minced spring onions. Your meal is ready. Use the chili sauce as per your taste. In this guest post Ms.Ratna Singh,a house wife in Jaipur, shares with us how to cook lentils the way her husband likes. Nature has blessed us with a big variety of lentils and man in his wisdom and to add spice to life has come up with numerous ways to cook them. The following simple recipe shows us how to cook chana and washed moong lentiles. Time taken : About 1 hour. Clean the lentils & soak the lentils in some water for 1/2 hour.Wash the lentils in the water used to soak the lentils and throw away the so used water.Put the lentils in a pressure cooker and add the following items. 4 Cups Water to pressure Cook the lentils. Pressure cook the lentils on high flame till the cooker gives 2 whistles.Turn off the flame and let the cooker cool off. Now take a wok and put in a table spoon of butter or desi ghee and 1/4 Tea Spoon of Jeera(cumin) and fry it on low flame till it changes color now add 1 tea spoon of Ginger & Garlic paste and Saute for some time then add 2 pinch of heeng . Now add 3/4 tea spoon of red chillies ,3/4 tea spoon of coriander powder, 1/4 tea spoon of turmeric and salt to taste with some water to the mixture in the wok.If you like you can also add one minced green chilly. Cook on low flame till the oil separates. Now stir in the boiled lentils with the water in the cooker to the wok and bring to boil. You can garnish the dish with Lemon Juice to taste and with green coriander leaves.